The Huichol are indigenous people of Mexico who live in the central northwest mountainous region of the states of Navarit, Jalisco, Zacatecas, and Durgango. Originally tobacco farmers, more recently the Huichol people have become known for selling their brightly colored craftwork that depict traditional designs with symbolic and religious significance. Two types of beadwork are especially popular. "Yarn Paintings," where commercial yarn coated with wax or resin are pressed onto shapes, such as bowls or masks, and then covered with individual beads to form intricate and colorful designs. The other form of beadwork is bright bead weaving designs in shapes that reflect the Huichol's respect of nature and their religious traditions. Shapes such as flowers, plants, and animals are popular. Brightly colored Czech seed beads are most often used for Huichol style beadwork. These types of beads have a round shape and the bead sizes are slightly irregular. These characteristics work well for the organic style of the Huichol that often features round shapes, such as flowers. Czech beads come in a wide variety of colors and finishes. 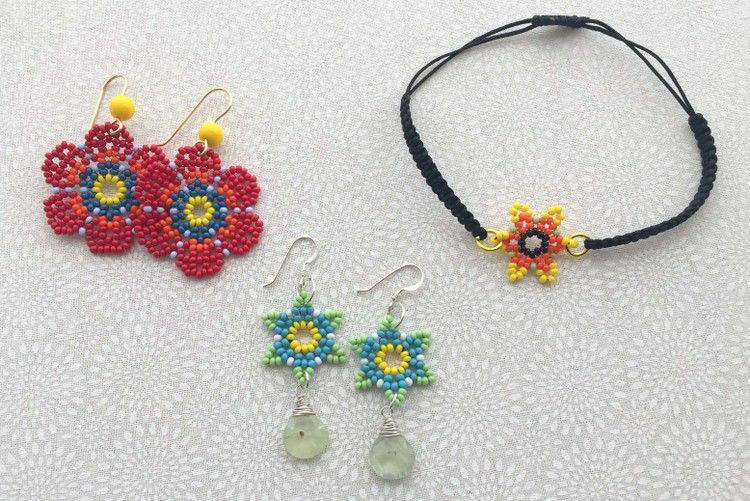 Although traditional Huichol designs typically use opaque beads, it is fun to experiment with these designs using combinations of transparent, metallic and opaque beads. Scissors that are good to cut beading thread with. 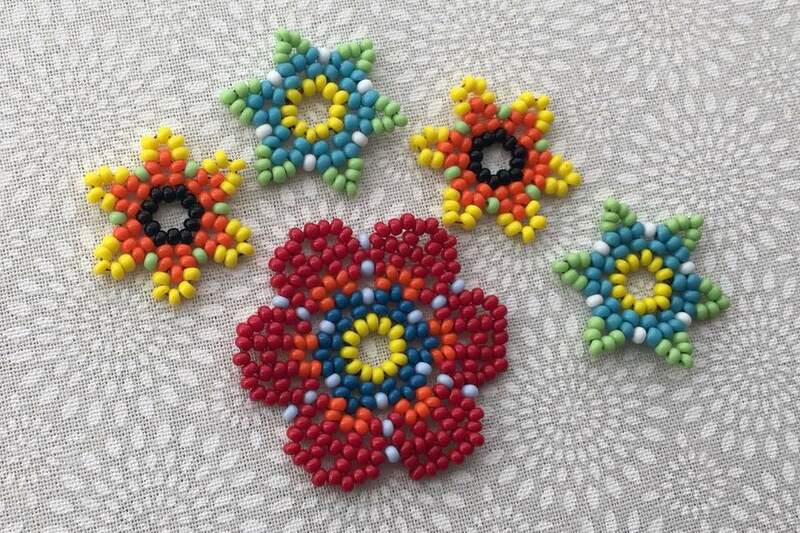 This daisy flower is the perfect place to start learning Huichol style beadwork. It is a simple design, very quick to make, and will teach you the basics of the circular netting stitch that is the foundation of Huichol beadweaving. It is also a great way to use up small quantities of leftover beads. If you are a visual learner, follow along with this daisy flower picture tutorial. The step by step pictorial includes how to make a beaded chain with leaves to hang your daisy flowers on. Otherwise, follow the step-by-step tutorial, which also includes additional information how to transform the daisy shape into a star shape. It may be hard to believe, but by adding several more rounds of netting stitch to the daisy flower, you can end up with these gorgeous, show-stopping blooms. There are a variety of tutorials available to make these flowers. The Huichol large flower tutorial we used to make these earrings is primarily visual. The instructions are in Russian, but can easily be translated to English in your browser. There is a similar Huichol flower tutorial that has the advantage of being in English and also has a useful blank bead chart that you can print and then color to plan the bead colors you would like to use. The same site also has a video tutorial, but it is in Spanish. As you can tell from the tutorials, Huichol beadwork is popular all over the world! An interesting embellishment you can add to Huichol flower designs is fringe. This free tutorial adds an elegant fringe variation that looks like flower buds! Huichol style beadwork is not limited to flowers or earrings. Bracelets can be made with the same bead netting technique. When bead netting is done in a continuous strip, it results in a lacy and flexible, yet solid bead fabric. The intricate designs and proliferation of color make these bracelets unique and striking. This bracelet is made from a beading pattern called "Ojo de Dios," which translates to "Eye of God." Follow the color diagram in this tutorial to recreate the same pattern.